I’ve just uploaded the latest version of the Movement Table, moving from v5.2 to v6.0 – access it via the blogroll on the right of the page. Following help from ‘Andy’ via his comments on this blog I’ve also added a note to the production date section at the end of the table, to reference a different type of serial number. 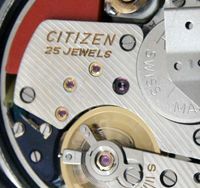 This entry was posted in Vintage Watches and tagged Vintage Citizen Movement Table, Vintage Citizen Watches. Bookmark the permalink. Was wondering if you could help me ID a watch. 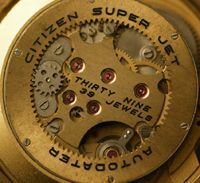 Ostensibly 21J with round golden dial. Green glow-in-the-dark dots every five minutes. It has squares at 6 and 9, two squares at 12 and day/date at 3. Cheers mate. Any help would be gratefully received. Oh ripper. You have decribed it perfectly. Except for the eagle and 7. Possibly a new dial? I don’t know. It was a cheapy from India. Was extremely reliable for a number of years, but now has a rattle and is difficult to start up. Any idea what this could be? Ah, if from India it is probably a re-painted dial. Sounds like a loose rotor – can you hand wind it? If the rotor is loose it could mean that the screw threads have worn away – you need to get the back off and have a look to be sure whether this is the problem. Can you help me to ID this watch? Hi Levi, thanks for visiting my blog. 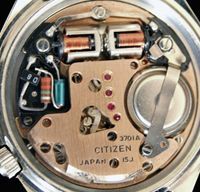 I can indeed help id your watch 🙂 You have a Cosmostar V2, which was produced in the early 1970s using the very nice high beat (28,800 eats per hour) 6600 / 6601 movement. They have either 17 or 21 jewels, and can run very accurately and reliably even with little or no servicing. The case material code (BL) suggests yours has a black coated case – is that correct? 4-66036 (does it have one more number in it, they are usually in the format of 4-xxxxxx?) is the case number, which also helps identify the movement. 64-1537 is the model number, which is not so helpful. GN-4-S is the case type, meaning it is a waterproof design with a screw on back. 2030310 is the serial number, and the first three numbers gives us the production date. Since these were only made in the 1970s, yours is from March 1972. Its glass is very scratched it can be replaced? You’re welcome Levi 🙂 I’m afraid original parts for Citizen’s older watches are very hard to find. The part number for your watch crystal is 54-50540 – I’ve checked a couple of suppliers but no joy I’m afraid. 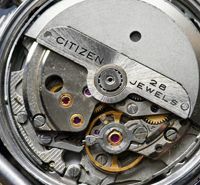 You could ask a good watchmaker to find an alternative – Jules Borel, a supplier in the USA lists an alternative for example. Thanks for the pics – it is a nice watch, and I hope you can get a new crystal for it. Helllo there, I was giving my Grandfathers watch after he passed and was hoping you could shed some light on it for me it’s a citizen model gn-4w-s and the serial # is 50690677. It’s also has cq stamped on the inside face under the glass, looks to be 70s to late 80s, thank you in advance if your able to help. Could you please help identify my watch. Nothing written on the dial except Citizen under 12 marker and 21 jewels on top of 6 marker. It has a date window on 3. Hi Migo – I believe your watch is from the mid-1970s, and has an 1810 ‘Homer’ movement. This is the date version of the 02 Homer, a movement first produced in 1960 and made right through to 1980 or so. This model has no serial number unfortunately, so we can’t date it exactly. the ’63’ prefix to the model number is typical of Homer models. The use of water ‘resistant’ rather then ‘proof’ means it must be later than the early 1970s. You can find more on the ‘Homer’ movements by searching my blog and taking a look at the 02/Homer Family Tree. Hi again Stephen. Thank you for your fast reply and the information. Just curious, how do you know the cal is 1810? I just check and find a very small code and yes it says 1810. Could you help me I found this watch on a trail in Tn. Some years back and put it away in a box I took it out to put a battery. 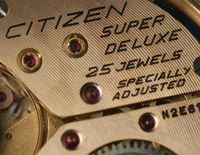 Citizen watch: 3220. S 04573 SMW. 8043657 GN4-5-5. Thanks for your help.